This center has two joint laboratories in other divisions. We are focusing on the discovery, design and developments of new molecules and molecular transformations, which enable efficient utilization of chemical resources, such as universal and ubiquitous metals (Fe, Mg, Al, Si, Zn, etc. ), as well as biorenewables (lignin and amino acid, polyols, etc.). We investigate the fundamental chemistry and physics of “functional oxides” and seek innovative materials with new functional properties. 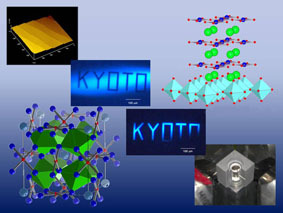 High-pressure synthesis and epitaxial thin-film growth are our characteristic techniques to prepare new materials. We also focus on research with technological applications such as employing oxide materials for electronic devices. 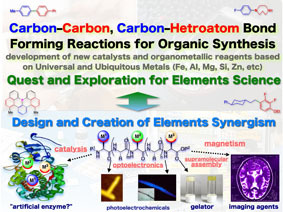 Our research activities are devoted to the development of functional transition-metal complexes based on the concept of “synergy of elements” . 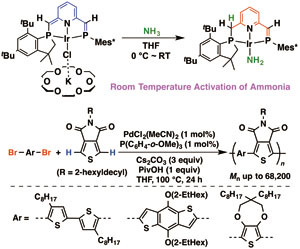 Recent topics include: (1) 3d metal complexes with low-coordinate phosphorus ligands; (2) new catalytic reactions to synthesize π-conjugated polymers with well-defined structures. Our research interest is to understand optical and quantum properties of nanometer-scale materials and to develop opto-nanoscience for creation of innovative functional materials. 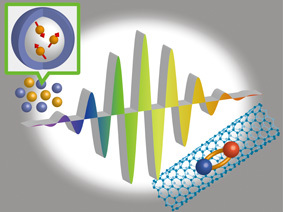 In particular, we study optical properties of single nanoparticles, carbon nanotubes, wide-gap semiconductors, and arranged nanoparticle superlattice solids by means of space- and time-resolved laser spectroscopy.